We play in either the Wenlock Hall or the Jubillee Hall at Lilleshall National Sports Centre. Starting at the roundabout where the A41 meets the A518 (the "Focus" roundabout) just southeast of Newport, follow the A518 towards Telford. Take the first exit at the first roundabout (towards Chetwynd Aston). Look for the signed entrance to Lilleshall National Sports Centre on the right, about 3/4 of a mile along this road. Turn into the drive and continue, (taking care over the speedbumps!) and you will come to a crossroads with Pitchcroft Lane, where you have to Give Way. Go straight over and continue up the drive until you reach the sports complex and Lilleshall House. Park in the first carpark on the left (over the cattlegrid) and look for the Wenlock Hall almost straight ahead of you as you drive in. 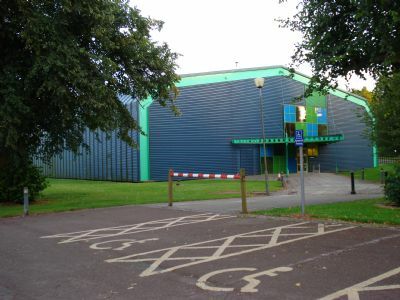 It's the big blue/green sports hall. In the Wenlock Hall we usually play on the four courts nearest the entrance. The Jubille Hall is across the road from the Wenlock Hall, and on your left if you walk up towards the main house.